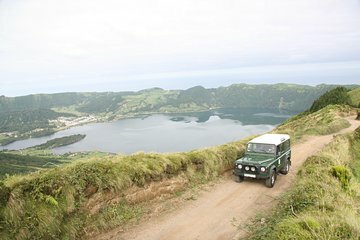 Discover the breathtaking beauty of the Caldeira de Sete Cidades on a Jeep tour from Ponta Delgada. The Sete Cidades volcanic complex on the western side of São Miguel Island is one of the more famous sites in the Azores. Stop at scenic lookouts such as Rocha de Relva and Pico do Carvão, and walk along the caldera rim to look at the twin lakes. Visit the village of Mosteiros and have the option to swim in natural thermal pools near the Ferraria coast on this informative tour.